The primary reason I wanted to dine in Cafe Ritazza was because the food court in Marina Mall was so crowded the last time I went there. 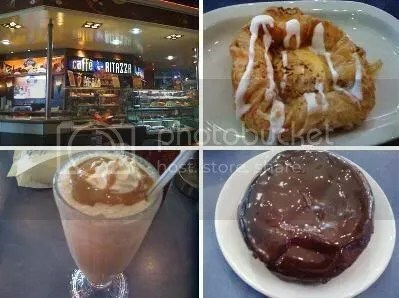 This cafe is situated near the food court and it has a London Dairy stall beside it. I was a little disappointed because it has a slow service. However, the choco dough which was served with a hot syrup on top is awesome, its vanilla crown is a must-try, but the iced mocha is nothing special. i really think that its a must try. however, the shake seems to be ordinary. as you said, it appears to me like nothing is really special in it.